The Auto Scout in Boise, ID is a small, family-run business with a reputation for offering quality used cars at great prices, excellent service, and financing options that work for most everyone. You can contact us online, call us at (208) 968-CARS (2277) or text us at either (208) 350-3711 or (208) 779-CARS (2277). The Auto Scout has high standards for the pre-owned cars and trucks we sell. Our inventory includes the most popular models of cars and trucks, and we inspect each vehicle to make sure it is free of major mechanical or cosmetic issues. We also offer an AUTOCHECK vehicle history report on every car we sell. You can browse our selection of cars and trucks by visiting our Boise location on Cole Road, just south of Costco or by using our online search tool to find vehicles that fit your specifications. 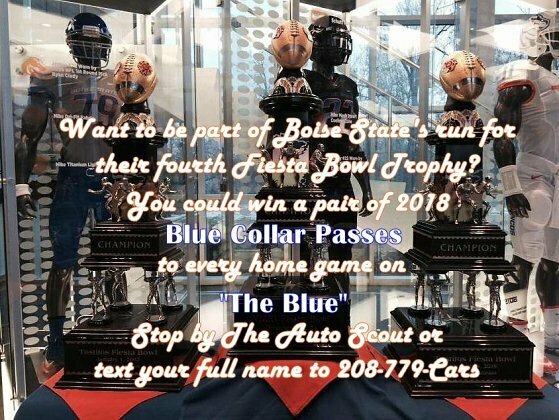 Be sure to visit our FaceBook page at https://www.facebook.com/boiseautoscout/ and follow us on Twitter at @AutoScoutBoise! Give us a call today to to have us help you find that perfect vehicle. Remember you can contact us online, call us at (208) 968-CARS (2277) or text us at either (208) 350-3711 or 779-CARS (2277). In addition to our inventory of cars and trucks, we sometimes carry RVs and motorcycles. The Auto Scout can help you find affordable loans for your pre-owned car. Simply complete the secure credit application. On occasion we may offer in-house BUY HERE PAY HERE financing that makes it easier than ever to get back on the road regardless of credit history. If our current inventory does not have the car or truck you are looking for, please fill out a Vehicle Request. Our Auto ScoutS will search across the country to find the car of your dreams. The Auto Scout offers a number of extended service contracts for added protection and to keep your new pre-owned vehicle in peak condition, not to mention peace of mind. We will also pay you top dollar for your current car in trade. Our sales representatives are just call, click, text or drop-in away to answer your questions. Contact us online, call us at (208) 968-CARS (2277) or text us at either (208) 350-3711 or (208) 779-CARS (2277).